JBC Tools DR560-A Desoldering Iron. DR560-A is a desoldering iron for thin desoldering jobs of SMD or conventional components. It is capable to provide up to 160W, if it is required. The exclusive JBC heating system and the suction power from MSE or MVE pumps ensure the optimum quality of work performed. The solder chamber of glass is very easy to clean and it allows you to appreciate the right time to do it. The filters can be easily replaced. DR560-A uses C560 cartridges with internal diameters of 0.6 mm to 3 mm. There are few tips specially designed to clean traces of tin from PADS. 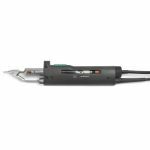 Purchase JBC Tools DR560-A Desoldering Iron Handpiece sold by Howard Electronics Today!